Solemn Vespers were celebrated in The Chapel Royal in Hampton Court Palace on Tuesday 9 February 2016, in all probability for the first time in 450 years. There were many news reports about this event, concentrating largely on the history of the Chapel and the Palace and reporting details of the planning of the event and its musical content. These reflections are more personal. It was a remarkable event, not because in Vespers I was together with the Bishop of London (who is Dean of the Chapels Royal) or because we were praying together. That is quite ordinary. It was remarkable because of the location. I felt this most profoundly as we 'lined up' in a corridor outside the chapel waiting for our entrance procession to begin. I was taken aback to realise that I was at the end of the procession, in the place of the celebrant, dressed in cope and mitre, while in front of me in the procession was the Bishop of London, the Dean of the Chapels Royal, in Convocation robes, 'choir dress'. This brought home the historical nature of the moment. It reminded me of an early suggestion that the whole event be entitled 'The return of the Cardinal’. I had objected to that. 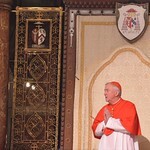 Yet, at the end of our public discussion, Bishop Richard had spoken the final words: 'Welcome home, Cardinal!' He was so gracious. So here was a Cardinal about to enter this Royal Chapel as the presiding celebrant! As we waited, I thought about all the people who, over the centuries, had entered through this same doorway into the Chapel. There were many who preceded the turmoil of the Reformation: members of the Knights Hospitaller of St John and, of course, Cardinal Wolsey. Catherine of Aragon and other wives of Henry VIII prayed there, as did Cardinal Pole, at the time of Queen Mary. So many dramatic and intense moments of our history have taken place here, or are symbolised by this Chapel. The weight of history was tangible and heavy. I thought of Henry's angst and anger and how he had brought such energy to the destruction of all that represented Rome. Earlier I had walked past the painting, on the Haunted Corridor, of the four evangelists hurling great stones down onto the figure of the prostrate Pope! It was painted in 1540 and replicated the cover of the first editions of the Coverdale Bible. It is unambiguous. Yet there were other figures who had entered this chapel for whom life was more ambivalent. I thought of Thomas Tallis who served as musician under at least three monarchs and managed to bridge expectations without falling fowl of threats and laws. Then there was the remarkable William Byrd who had served in this chapel, too, especially for Elizabeth I. She wanted him there. She even helped to pay his recusancy fine, which without her help would have been crippling! Her personal desire was for a rich and full liturgy, and she resisted the Puritan pressures of the time. But she also used him and the Chapel as a significant factor in her foreign policy, bringing ambassadors to its liturgies so that they might send back favourable reports to the Catholic monarchs of Europe. These were the footsteps I was following as we entered the chapel. The music was, of course, sublime. And music carries such evocative power. Whenever I hear Britten's War Requiem I remember the first time I heard it, in the Scala Santa Cecilia in Rome in the 1960's. When I hear the Beatles music I am immediately back in my youth. Music carries us where otherwise we might not go. And this was true of the music of Vespers. After the ceremony, many spoke to me of the effect of the Latin psalmody on their spirits. They had experienced a spiritual calm and uplift which was fresh to them. For my part the most remarkable piece of music was the 'Salve Regina' by William Cornysh which was sung at the end of Vespers, during which I incensed the statue of our Blessed Lady. That piece of music was sung at the famous and extravagant meeting between the kings of England and France in 1520, known as 'The Field of the Cloth of Gold'. I could not help remembering that St John Fisher was present at that event. He would have heard this music, just as I was listening to it in the Chapel Royal. What a moment! I was almost standing alongside him! The moving and eloquent way in which Bishop Richard gently placed Mary at the centre of our ecumenical quest touched me deeply. My thoughts flashed back to Walsingham and the impassioned plea that I had heard, just before Christmas, from the 100 year-old Mgr Augustine Hoey that we must pray, pray, pray with Mary for the healing of ancient wounds. There was something immensely profound, and almost tangible, about this evening in Hampton Court. As I left, going into the cold night air, across the beautiful Tudor courtyard, I knew my life had been touched and a light had shone on that entire period of our history, which shapes us all so radically. May Mary's prayers, and our prayers offered in every Marian shrine and chapel in the land, move our hearts to shift through the wreckage of the Reformation and find these golden threads of profound faith which, if we are humble and receptive as she was, can be woven afresh by the Lord into the banner of Christ's Gospel to be carried together with confidence and joy in our society today.